Happy Happy hour everyday….Be sure to try any of our innovative and outrageous martinis. Join us for lunch, dinner and Live Performances Thursday – Saturday evenings. The City of Orange was originally called Richland. Agriculture and livestock were its mainstay, although raisins were its largest source of income in 1886. The first orange trees were planted in 1872. The City’s name was changed a year later, after the U. S. Postal Service complained that the name was similar to another postal service in Sacramento. Legend has it that four gentlemen; A. Glassell, A. B. Chapman and two others played a poker game, with the winner naming the town. (A. Glassell grew up in Orange County, VA). Guess who won the game? 2000 – With a lot of enthusiasm and years of restaurant business experience, Steve Tsirtsis and Steve Xenos take over the Citrus City Grille. They renovate the concept and the menu to create the “new look” of the restaurant. These renovations promise a lot of extraordinary and outrageous tastes to come. 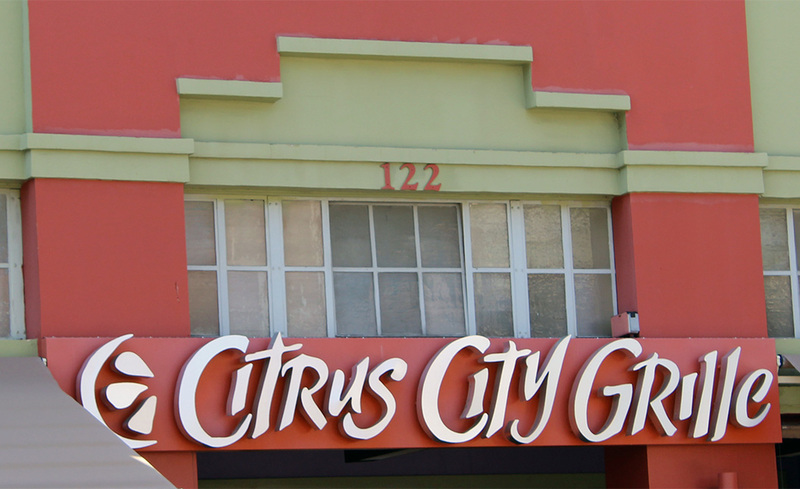 2005 – Citrus City Grille expands by opening its second location in Riverside County. CCG selected the Riverside Plaza for its new home due to the similarity to Orange. Riverside is rich in the history of California’s growth. This bustling plaza is the Inland Empire’s newest Lifestyle-Entertainment District. 2008 – Citrus City Grille opens its third location and second restaurant in the Inland Empire, in Corona at The Promenade, Dos Lagos. The Promenade is Corona’s first lifestyle center which brings unique specialty retail to the southern Inland Empire area to meet the needs of the growing and increasingly affluent population.